When we set out to make this year’s visual report, we were inspired by all the platforms we found at GDC this year. Whereas last year, GBR mostly only looked at hardware platforms, but this year, we found not just great hardware platforms to publish to (like mobile devices or consoles), but also online platforms too, so we put some of these in too. 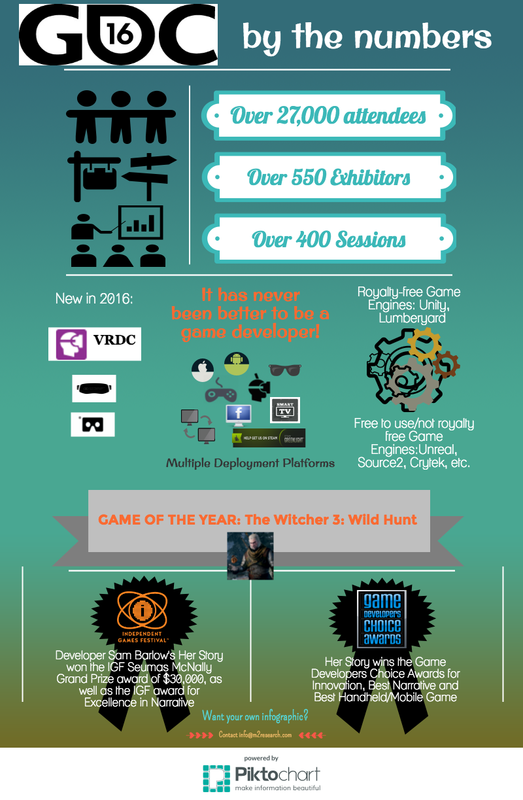 Mainly this infographic focuses on the bigger players offering game distribution platforms, but this coming year we hope to shine our analyst spotlight on some new and/or emerging game publishing platforms. Game developers certainly have a great variety of platforms to choose from to publish to! At next year’s GDC, we expect we’ll see even more new and exciting publishing platforms, especially since cloud game development and deployment is really growing.